Germany Gets Rid Of Its Top Music Prize After Anti-Semitism Controversy : The Record After being accused of expressing anti-Semitism in their lyrics, controversial rap duo won an prize at this year's Echo Awards. In response, the prizes are being shut down and relaunched. 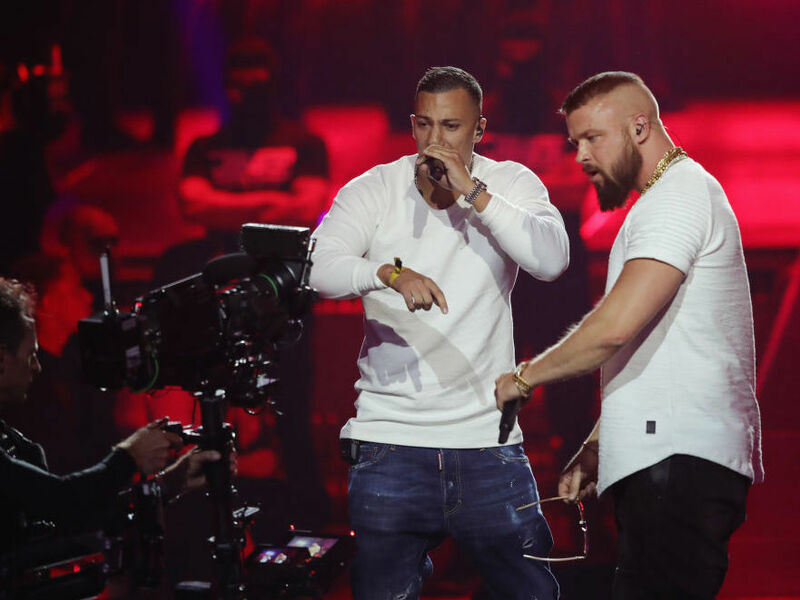 Controversial hip-hop duo Farid Bang (left) and Kollegah, performing at this year's Echo Awards show in Berlin on April 12. This month, the German music industry has been forced to reckon with accusations of anti-Semitism after a controversial rap duo, Kollegah (Felix Blume) and Farid Bang (Farid El Abellaoui), won the best hip-hop album award at the Echo prizes, the country's top music award, on April 12. Lyrics on the duo's winning album include boasts that their bodies are "more defined than Auschwitz prisoners" and that they will "make another Holocaust, show up with a Molotov." The duo had also faced condemnation for lyrics that, critics say, are misogynistic and homophobic. In a press release issued today, the country's top music trade association BVMI (Bundesverband Musikindustrie) announced that it would be getting rid of the Echo prizes altogether, writing: "The Echo will not exist anymore ... the Echo brand was so badly damaged that a completely new beginning is necessary." Moreover, the BVMI states that its board did not want the country's top music prize to be a "platform for anti-Semitism, misogyny, homophobia or the incitement of violence." Germany is the third-largest market in the world for recorded music, according to the International Federation of the Phonographic Industry (IFPI), which compiles annual statistics on the global market for recorded music. The BVMI's decision to abandon the Echo Awards comes on a day when rallies are scheduled to take place across Germany to show solidarity with Jewish people. Last week in Berlin, a man was attacked for wearing a kippa, or skullcap. The BVMI says that the nomination and awards criteria for pop albums will be "completely changed." Until now, awards in the Echo popular music categories were based on chart position, unlike the Grammys or the Mercury Prize in the U.K. The classical and jazz Echo awards were already given out as artistic achievement prizes, as decided by a jury; now, it seems that the pop categories will follow suit. After Kollegah and Farid Bang's win, numerous German and German-based artists have returned their prizes in protest. They include the Berlin-based conductor and pianist Daniel Barenboim, who returned his awards on Monday, saying that the Echo awards legitimized anti-Semitism. Barenboim, who was born in Argentina but also holds Israeli, Palestinian and Spanish citizenship, said he waited nearly two weeks to register protest in order to see if the "responsible people" responded "adequately."